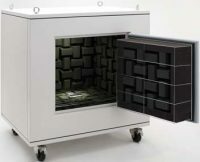 Carefully controlled acoustic properties provide a stable and quiet environment for measurements. * Suitable for use in testing and developing small size precision instruments. * Wall reflections are damped for enhanced measurement accuracy. * Wedge-shaped absorber layer provides high sound absorption efficiency. * Compact dimensions and casters provide mobility. * Available as standard type L or H with higher sound insulation and absorption characteristics.